Since 2008, the business unit Mitsubishi Chemical Advanced Materials Composites has been involved through a company of its own in the development of special lightweight components made of long-fiber-reinforced plastic composites and hybrid materials, among other things for the automotive industry. At Mitsubishi Chemical Advanced Materials Composites GmbH located in Chemnitz, the search is on for new materials and hybrid strategies that enable entirely new component concepts and production methods thanks to the ingenious merger of metals and plastics. In close cooperation with the customer, capable teams of materials, design and production specialists draw up customized component strategies for innovative lightweight component applications. 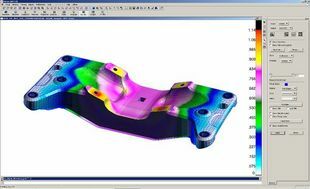 The services available comprise consultations on design and the choice of material, CAD and FEM computation, prototype construction, component testing and the planning of the series production of lightweight components. The QMPS development team is concerned in-depth with the design and engineering of structural components for automotive engineering. The goal in the various projects is to yield for the customer significant benefits in terms of weight reduction, function integration, and reductions in the numbers of parts and production steps.